The NRC recently (finally) came out with their doctoral program ranking. I’ll leave the ranking for another day and focus on the treasure trove of data available. Lets consider the numbers for minority1 and women students and faculty in my field. Figure1. This is percent Minority graduate students vs. 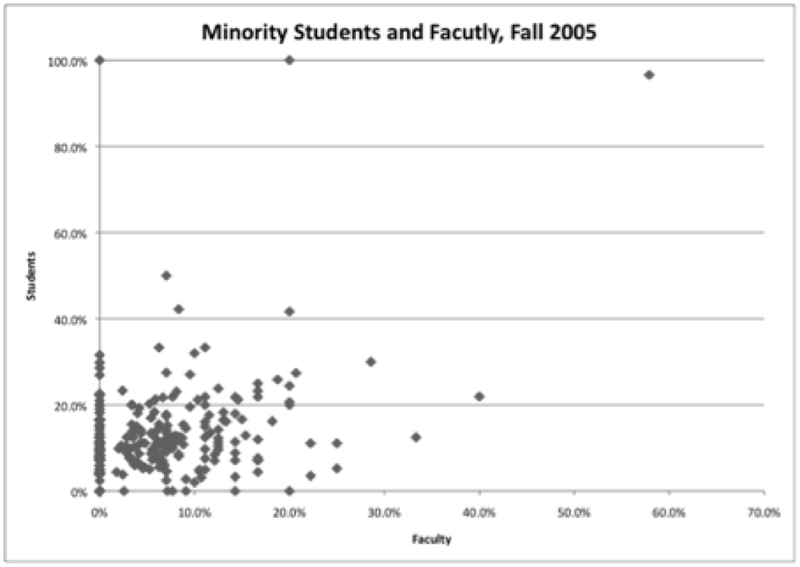 Percent Minority Faculty. For comparison purposes, I believe that the corresponding U.S. population percent is about 30. The median values are 6.2% for Faculty and 11.1% for students. A full 28% of programs reported zero minority faculty. There are more programs with 0% than at least 10%. Since this is a ranking of sorts I then looked at the “top” programs. My Top50 is based on the NRC ranking, which while not perfect are a decent yardstick for taking a look at the most active R1 departments. The general trend is that these departments have smaller percentages. The median values at the top tier schools are 4.3% for faculty and 9.3% for students. The most interesting thing here is that the percent drops so much from graduate student to faculty. There are various pipeline related reasons for this I assume. I’ll cover that another day. 1. According to NRC methodology, they’re going with reported non-Asian minority. I’m guessing this is meant to be a proxy for underrepresented minority, which would include hispanic/latino, afr-am and native American.